I have had a seriously fun afternoon. 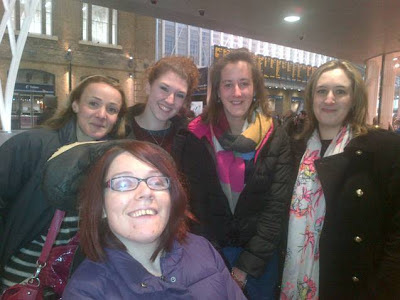 If you were standing at Kings Cross St. Pancras railway station in London at 1 pm today - somewhere near Pret a Manger - you will have heard squeals of delight as five young women met for the first time. It seemed like we had been best friends for years. In actual fact, we had only communicated via 140 character length tweets, a few emails and text messages in the last few weeks and months. And today was the day we all met for the first time. I think those sitting around us were a little bit intrigued by conversation. We talked non stop for at least three hours. As Meg has written beautifully in her blog - its not just Anorexia that bought us all together. Its recovery. It was an honour to meet them all and I hope we will all remain good friends and keep in touch. I particularly enjoyed meeting the wonderful Emma Woolf (great niece of Virginia Woolf). I really admire all her work. The "Apple" part of all this refers to Emma's amazing book "An Apple a Day". What brings them together? An Apple A day! Hides knocks they have taken, and bruising within. For an apple cares not of its weight, shape or size. But fear making them rhyme, would cause lyrical tension. Health and life, requires more than an apple a day. Key ingredients first needed, are Self-love and nutrition. Their friendship a weapon, bringing ED's to an end!